Rose de France is the name given to the markedly lighter, lavender hue of amethyst. This subtle, beautiful gemstone has been given a long pendeloque briolette cut with harlequin facets on top and underneath. Our designers have mounted it, appropriately, in rose gold with diamond accents at top and bottom. 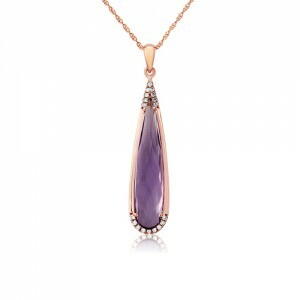 The total height of this gorgeous pendant is 35mm and it comes complete with a16 to 18 inch extender chain.